← Convert doc to PDF in batches. The SDK Mini EMF Printer Driver is specially designed for software developers for developing their own applications to realize the function of printing printable documents to image format. It supplies command line and virtual printer applications to users for calling. By using the command line application to convert word to image, you just need to input some easy commands in MS-DOS interface. 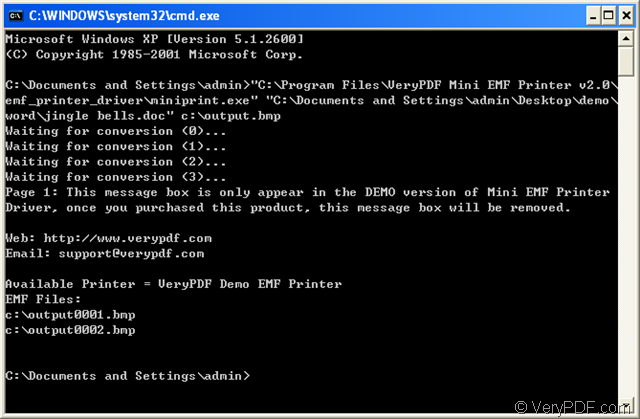 The command line application MiniPrint.exe is included in Mini EMF Printer Driver package. You can run MiniPrint.exe in command line window to convert DOC, PPT, XLS, RTF, PDF, VSD files to EMF, WMF and BMP, JPEG, TIFF, PNG, GIF, TGA etc. files. 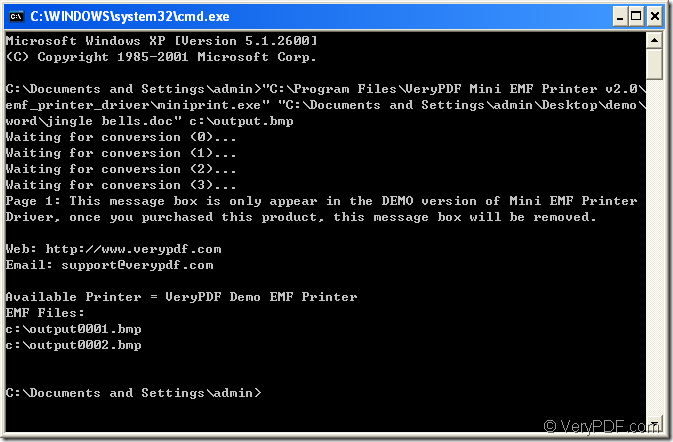 If you want to use the command line application MiniPrint.exe, please click here to download Mini EMF Printer Driver for free and install it on your computer. The default directory for the command line application is C:\Program Files\VeryPDF Mini EMF Printer v2.0\emf_printer_driver\ miniprint.exe. You can buy the developer license of Mini EMF Printer Driver at http://www.verypdf.com/order_miniemfprinter.html. You never need to pay any other fees for it no matter you want to develop, distribute your applications or add related components about the SDK into your applications in the future. 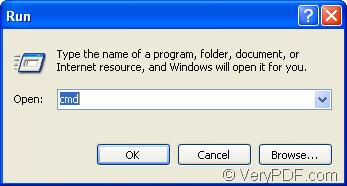 Please open MS-DOS command line window by clicking “Start” and click “Run” to open “Run” dialog box in which you should input “cmd” in “Open” combo box and click “OK” button. Please see it in Figure 1. In the pop up command line prompt window, you need to input the command line to convert word to image such as BMP format image. There is a basic command line you can refer to below. You just need to input the command line like it in the window. Please see the example command line in Figure 2 below for your better understanding it. "C:\Program Files\VeryPDF Mini EMF Printer v2.0\emf_printer_driver\miniprint.exe" stands for the path of Miniprint.exe. "C:\Documents and Settings\admin\Desktop\demo\word\jingle bells.doc" stands for the absolute path of input word document. c:\output.bmp stands for the absolute path of output image format. 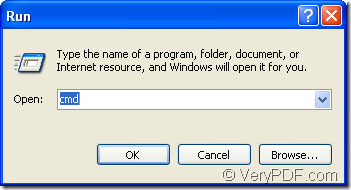 When the conversion from word to image is over, the target file will pop up on your screen itself. You can also find the target file in the specified location. Convert Word to image in batches. This entry was posted in Mini EMF Printer Driver and tagged Word to image. Bookmark the permalink.